With the many news headlines about the ongoing violence plaguing the Austin neighborhood on Chicago’s West Side, Vanessa Sanchez worries that the youth growing up in the community are unable to think positively about their futures. “We wanted to cultivate a positive outlook for the youth in the area and let them know that Youth Outreach Services is here as a resource for them” Sanchez continues. 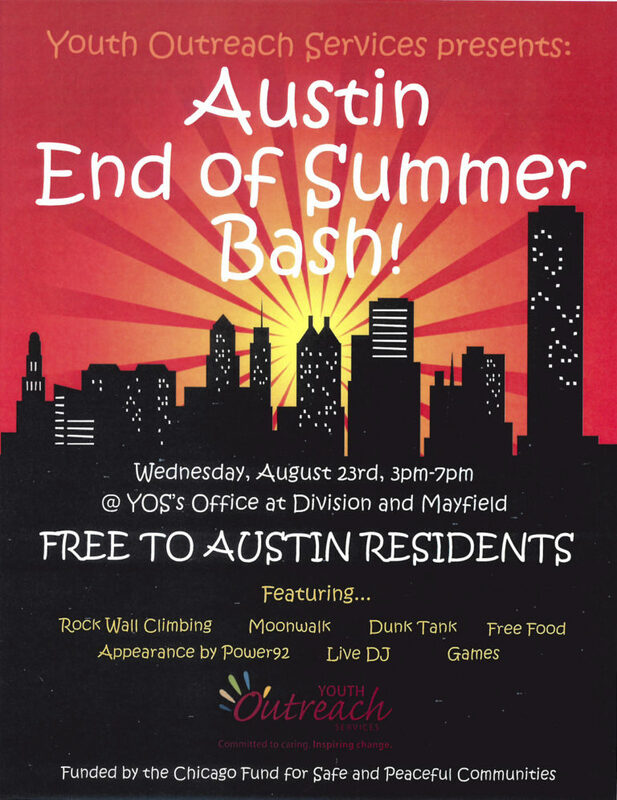 Blocking off a portion of Mayfield Avenue at Division Street, just outside the YOS’ Austin office, the End of Summer Bash will have free food, music and games for residents of all ages from 3-7 PM. For the kids specifically, YOS is giving away school supplies and providing fun activities such as rock climbing, a dunk tank and an appearance by Power 92 radio personality, HotRod. The goal is to create an environment where Austin youth can let their guards down and enjoy being a kid while feeling safe to do so, Sanchez says. Simultaneously, Sanchez wants families to learn more about the programs YOS has to offer – including drug and pregnancy prevention, juvenile justice, child welfare and counseling. Additionally, a portion of the End of Summer Bash will take place in YOS’ community garden. Dubbed the Austin Garden, Sanchez said YOS turned an empty lot into a beautiful space for the community to grow herbs and vegetables to cook. So far, the garden is home to watermelon, collard greens, tomatoes, eggplants, green beans, strawberries, basil, mint and more. The garden isn’t the only thing Sanchez wants to keep growing. After the End of Summer Bash, she hopes more people will look to YOS as a resource so the organization can help more people in the community.